I had heard the jokes, but I ignored them. I made myself a promise. I committed myself to the cause. Others had told me they never finished Oblivion, or any Elder Scrolls game for that matter, and that the lore was so rich, the game world so vast, that actually playing the game all the way through was nigh impossible. I was going to finish Skyrim. I failed. I remember my avatar's last location. The sneaky Argonian still sits crouched in the shadows in some ancient dungeon, atop a walkway looking down at Draugr corpses I had quickly dispatched moments ago. That poor character has been waiting atop that stone path since New Year's day, over two months. I never became bored of Skyrim per se. Sixty hours in, I was having a blast. It handily earned a place in my top three gaming experiences of the year, and even though I have since abandoned its majestic Nordic lands, I have no regrets about my decision. I love the expansive world, the massive sense of scale, the persistent sensation that although my character is dragonborn, she is still a small fish in a very large pond. I left for good reason. The holidays were ripe with gaming options, and I happily consumed a myriad of triple-A and indie games at my leisure. 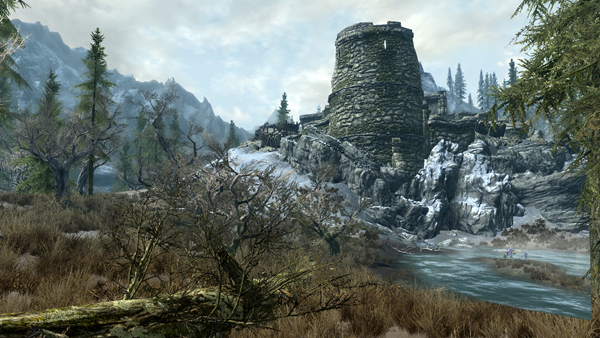 But the farther and farther I roamed from Skyrim, the harder I imagined my eventual return. I will play Skyrim again, to be sure, but when I do, I will have to commit myself again, devote another sixty hours into the experience, and who has that kind of time? Mass Effect 3 just hit store shelves today, and I have another galaxy to save. Soon, Journey will grab my attention, if I can even pull myself away from multiplayer gaming. I have failed. Skyrim's hero has abandoned her. I only hope absence makes the heart grow fonder. I have been traveling for 7 months and recently decided that when I settle down somewhere (which will be soon) the first game I buy will be Skyrim. I've never been one to get into games like Oblivion or Fallout 3 in the past, however with Skyrim I too have promised myself that I will "finish" it. Or perhaps more accurately - I have promised myself that I will take my time with the game and invest myself in it. Actively try to complete side quests and get to know the characters inhabiting the game world instead of just rushing though the main story as I've been prone to doing in the past. I think that the key to my success will be NOT buying any other 360 games for a while. That way I'll be forced to play Skyrim... or one of the 30 or so games I have on my iPhone. "Well, it looks like our mythical hero has abandoned us." "I heard he went into space to fight shadow robots and Martin Sheen." "I heard he went into the desert on some sort of...quest...or trip...or was it Odyssey?" "I, for one, welcome our new dragon overlords." I think committing to taking your team is a wise choice. In fact, that's a better way to look at my own predicament. I'm savoring and cleansing my pallet before heading back in.